Air quality in Essex County, Massachusetts is 85 on a scale to 100 (higher is better). This is based on ozone alert days and number of pollutants in the air, as reported by the EPA. 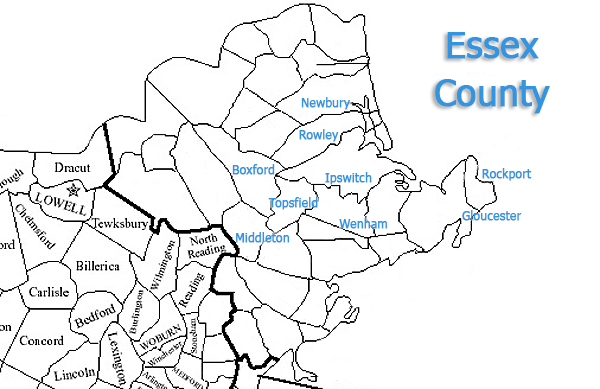 Water quality in Essex County, Massachusetts is 13 on a scale to 100 (higher is better). The EPA has a complex method of measuring watershed quality using 15 indicators. Some of the more common water filtration and water softening needs in towns such as Boxford, Hamilton, Georgetown, Groveland and Topsfield include Arsenic, Radon, High Iron, Manganese and Low pH. Newbury, Ipswichand other coastal towns like Newburyport and Gloucester may also face salt water intrusion into their private wells if drilled near the ocean, marshlands. or other waterways. The town of Boxford consists of all private wells with no town water supplied. Remediation of these problems can be achieved with water softeners, or other water filtration systems for pH neutralization, arsenic specific resin for the removal of arsenic from well water, radon removal systems and reverse osmosis purification. Salt water intrusion into wells will need a whole home reverse osmosis system to effectively desalinate the incoming water supply, something H2O Care, Inc. has become expert at. Have your water supply tested for contaminants by contacting a H2O Care treatment professional. If it is a health threat related contaminant such as Arsenic or Radon, we can help you prepare a proper sample to send to a state certified laboratory and assist in interpreting the results. For basic water testing for pH, Iron, Manganese, Hardness or Total Dissolved Solids, we offer complimentary water tests to Bristol, Essex, Middlesex, Suffolk, Norfolk, Worcester and Plymouth counties. Water filtration and/or water softener specifications will be determined by the results of this water testing.